Research has revealed non conventional sub-station technology as the way forward for rural electrification in developing countries where there are well established high voltage transmission line infrastructure but lagging behind in distribution network. A study by Prof George Anderson revealed that non conventional sub-stations can step down either 132kv or 220kv to low voltages of 240 volts in one step to supply single phase loads. In his study, he further found out that these technologies are cheaper than conventional sub-station. In the most recent paper by Mr. Kitheka Joel Mwithui, the life cycle costing of ASVT sub-station was found out to be a third the cost of implementing conventional sub-station of the same rating. These sub-stations can be used to alleviate the problem of supplying electricity to villages living at close proximity to trunks of high voltage transmission lines used to supply electricity to the major towns, commercial centres and industrial areas. The sub-stations are relatively cheap, enabling the utility company to realize returns on investment. Non conventional sub-stations includes; Auxiliary Service Voltage Transformer (ASVT) and Capacitor coupled sub-station (CCS). In his paper, Mr. Kitheka Joel Mwithui, revealed that the ASVT sub-station can be terminated on any point of the 440KM, 132kv transmission line without voltage profile violation. This study supported the idea that, termination of ASVT sub-station to supply a village should depend on the location of the village to be supplied with electricity. This is due to the fact that location of a village is governed by economic factors. Further research by Mr. Kitheka Joel Mwithui revealed that a maximum of nine ASVT sub-stations can be used to supply villages living at close proximity to 440KM, 132kV transmission lines without voltage profile violation. The termination of the tenth ASVT sub-station led to a drastic change of the voltage levels. This indicated that the surge impedance loading of the transmission line had been affected leading to violation of the voltage profile of the line. 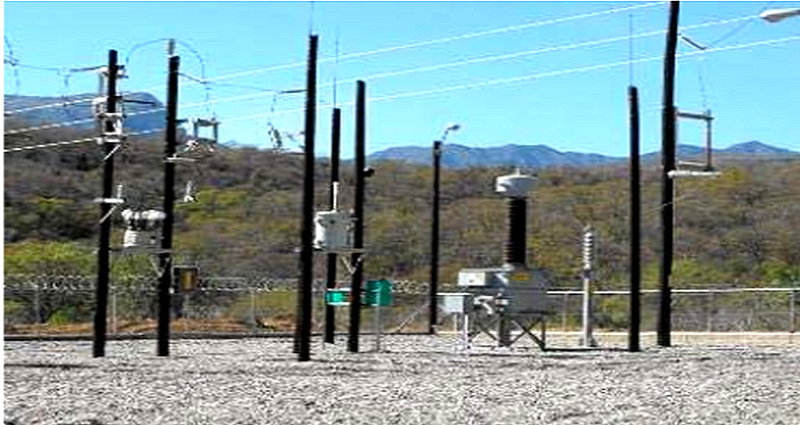 The violation of the transmission line voltage profile led to voltage instability of the system. Further termination of the ASVT sub-stations on 440KM, 132kv transmission line led to voltage collapse of the system. The simulation study was carried out in Simulink software in Matlab environment using this power network. A practical ASVT sub-station on power network produced by Eng Omar Calvo and Eng. Roland Gomez is captured below. Mr. Kitheka Joel Mwithui, is a Registered Graduate Engineer and a Trained Technical Teacher, currently pursuing Msc in Electrical Engineering (power system option) in Jomo Kenyatta University of Agriculture and Technology (Nairobi-Kenya) and a part-time Lecturer in Technical University of Mombasa (Mombasa-Kenya). He also served as a Graduate Assistant in Mt. Kenya university (May 2007 – Dec 2009). A paper about the study appeared recently in American Journal of Electrical Power and Energy Systems.